Kyle Lacy is the VP of Marketing at Lessonly and is also responsible for managing a team of sales development reps. 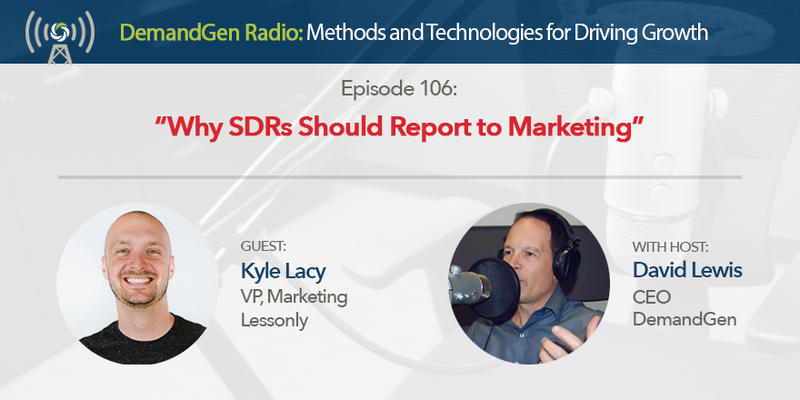 In this episode, we dive into the hot topic of whether SDRs should report to Sales or Marketing and you'll hear Kyle's passion for why SDR's should be an extension of marketing. Kyle shares why SDRs should be closely aligned with Marketing in order to maintain a cohesive strategy across top-of-funnel efforts. We also talk about the compensation models and quotas for SDRs and cover how to onboard and train a successful SDR team in your own organization. Nicholas Holland, HubSpot’s VP of Marketing Hub, joins the podcast to talk about HubSpot’s movement into the enterprise market and how their platform is evolving to serve larger and more sophisticated companies. Tune in as we talk about HubSpot’s replacement for the traditional demand waterfall, the marketing automation ecosystem, and where HubSpot is heading. Join us for another MarTech Monday episode as Nida Chughtai shares some big news taking place at Mintigo. Listen as Nida goes into detail around the partnership between Mintigo and Marketo and how Mintigo will now be powering the data behind Marketo’s AccountAI and other ABM solutions. Tune in to learn about Nida’s journey to VP of Marketing, what marketing is like at a marketing technology company, and how Mintigo can help you get the most out of your data. Few marketers are leveraging AI as much as Byron O’Dell and his team at IHS Markit. In this episode, Byron shares which artificial intelligence technologies he’s finding the most value from and how those tools are being used to automate sales outreach and marketing programs. Listen as we talk about the different applications for AI in marketing and what marketers can expect from artificial intelligence in the future. 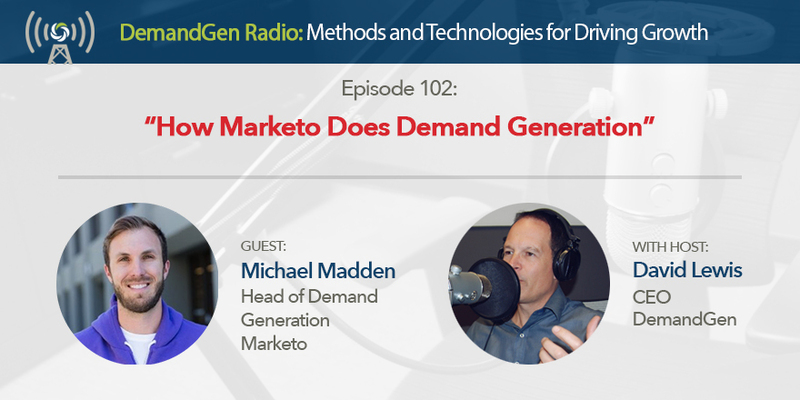 In this 100th episode of DemandGen Radio, I’m joined by Joe Payne, CEO of Code42 and former CEO of Eloqua. 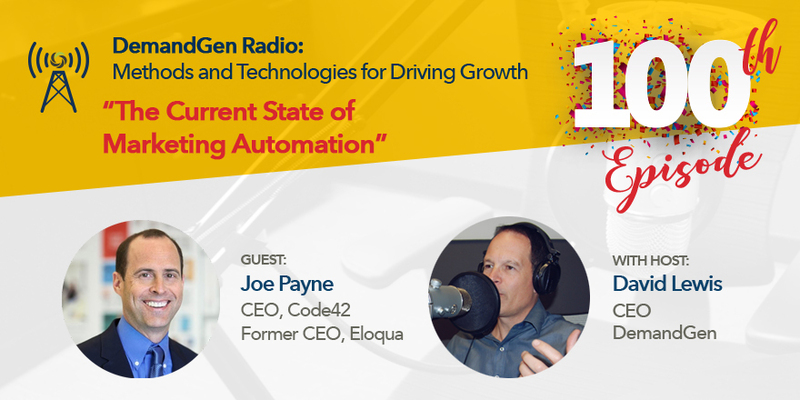 Listen as we talk about the early years of Eloqua and how Joe helped pave the way for a new era of marketing powered by the advent of marketing automation. Joe and I share how CMOs can be more efficient in the boardroom, why customer experience is so important, and dive into the current state of the marketing automation ecosystem. Adobe’s recent acquisition of Marketo means that exciting things are taking place in the world of marketing. Jay Dettling, Vice President of Global Partners at Adobe, joins in this episode to talk about the vision behind the acquisition, how it will transform customer experience management, and how Marketo will help support Adobe’s mission of changing the world through digital experiences. Listen as Jay also shares why he remains so passionate about the partner ecosystem, and why you should attend the upcoming Adobe Summit in Las Vegas in late March. Coming to you live from the B2B Marketing Exchange in Scottsdale, AZ! 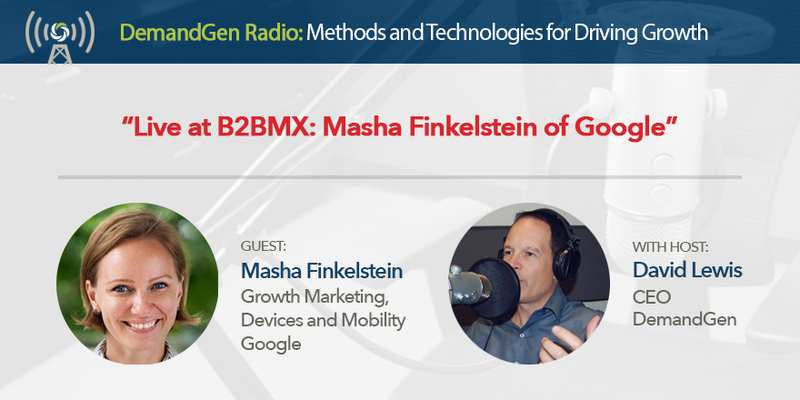 Tune in to listen to this episode as I sit down with Masha Finkelstein of Google at the event. Coming to you live from the B2B Marketing Exchange in Scottsdale, AZ! Tune in to listen to this episode as I sit down with Toni Boger of Siemens PLM at the event.